Applies intense moist heat which is useful in treating pain caused by muscle spasms from strain. Heats up quickly, comfortable and easy to use. Produces moist heat by drawing moisture from humidity in the air. Produces moisture for 20-30 minutes after which the unit should be set aside to regain moisture. 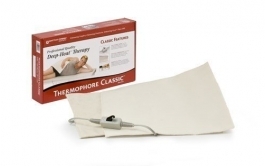 Moist heat stimulates tissue activity with deep, penetrating heat and temporary pain relief results.